Home » life » They Never Taught Their Dog To Do This, But He Did It Anyway. Just Beautiful. They Never Taught Their Dog To Do This, But He Did It Anyway. Just Beautiful. Everyone knows a dog is man’s best friend, but how about a little baby girl? Well, Charlie is an exceptional dog that takes on the role of babysitter, crib rocker, and even get the crossing lights for mom and child. He also is active elsewhere in his home. He makes sure everything is just right for baby and no child could ever have a better babysitter. Plus Charlie works for snacks and hugs,besides deeply in love with his charge. 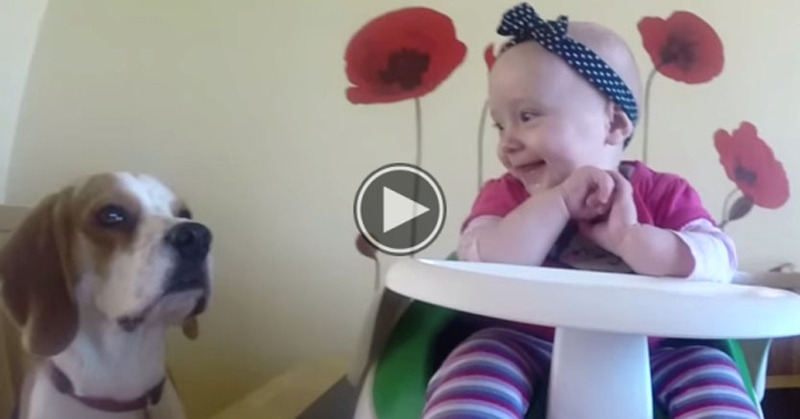 He proves that aBeagle can be the best babysitter ever. This K9 nanny has your local neighborhood babysitter beat. He is 24/7 and looks after this little girl at all hours. Fetches her toys and she never has to worry about having someone to play with. Plus Charlie has the patient of a saint as he allows her to do things that no self-respecting human babysitter would allow. In fact, Charlie’s spoils this little girl rotten. Best of all you have a babysitter that will never watch the tube, surf the net, and be found on a phone chatting to a friend and ignoring their charge. This kind of devotion can’t be bought for any amount of money anytime or anywhere. It has to be given and Charlie gives 100% and more day-in and day-out.